The past couple of days here in South Carolina have been very rainy. I think it's been raining the entire week! The other day, my husband was complaining that he hadn't seen the sun in forever, and I reminded him that April showers bring May flowers! With all the rain, this month's theme for the Hobby Polish Bloggers link-up is really appropriate! When the April Showers theme was announced, I immediately thought of how much fun it was to jump in puddles as a kid! OK, I'll admit it - I still do it! Jumping in puddles, dancing in the rain... I love to do it all! I started off with a base of OPI - French Quarter for Your Thoughts. I thought that my index finger was a little too plain, so I added a thin coat of Zoya - London, and used a sponge to lighten the color, but leaving the texture. It reminds me concrete. 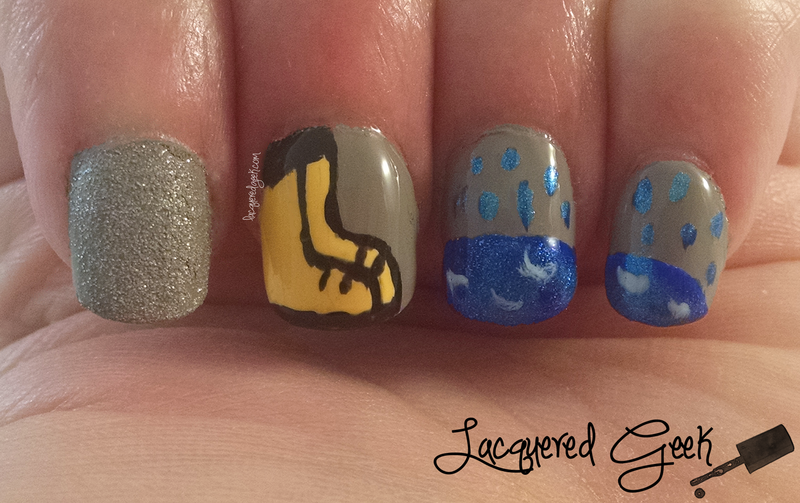 I painted bright yellow rain boots.using Sally Hansen - Lightening. They are all ready for jumping! On the next two nails, I painted my puddle. I used OPI - Alpine Snow as a base for the puddle, and topped it off with Orly - A Happy... Puddle, butter LONDON - Scouse, and Revlon - Surf Spray. 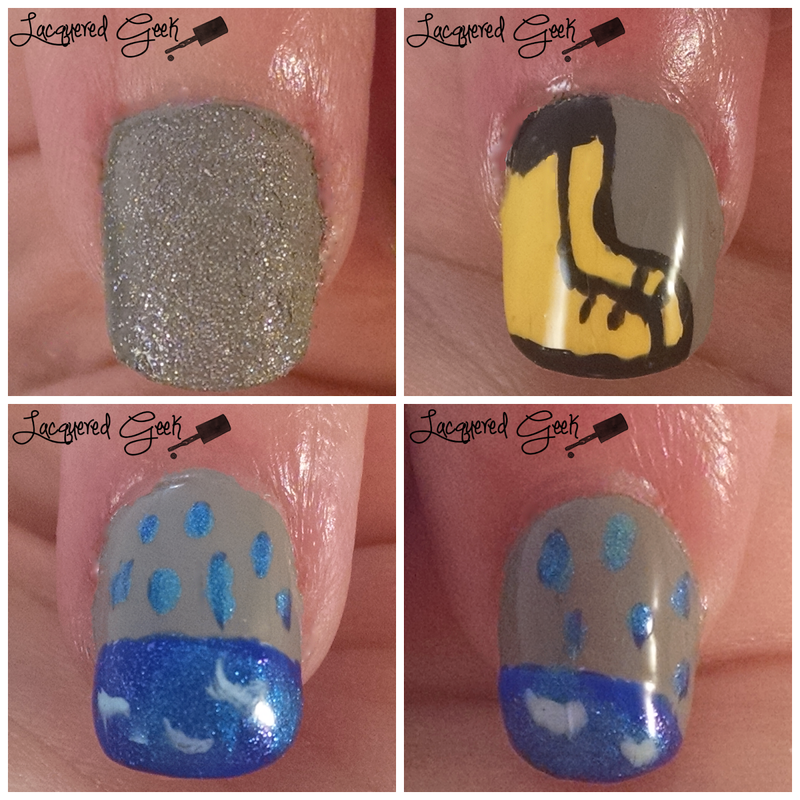 I used the same trio to create the raindrops, and Zoya - Blu to attempt to make the ripples from the raindrops in the puddle. I'm not sure I'm feeling the the raindrops and ripples, but I love the rest of the look! Overall, I'm pretty happy with this design. I think I captured those fun memories of childhood, and maaaaybe the other day too! Did you enjoy jumping in puddles as a kid? What did you think of my take on April Showers? 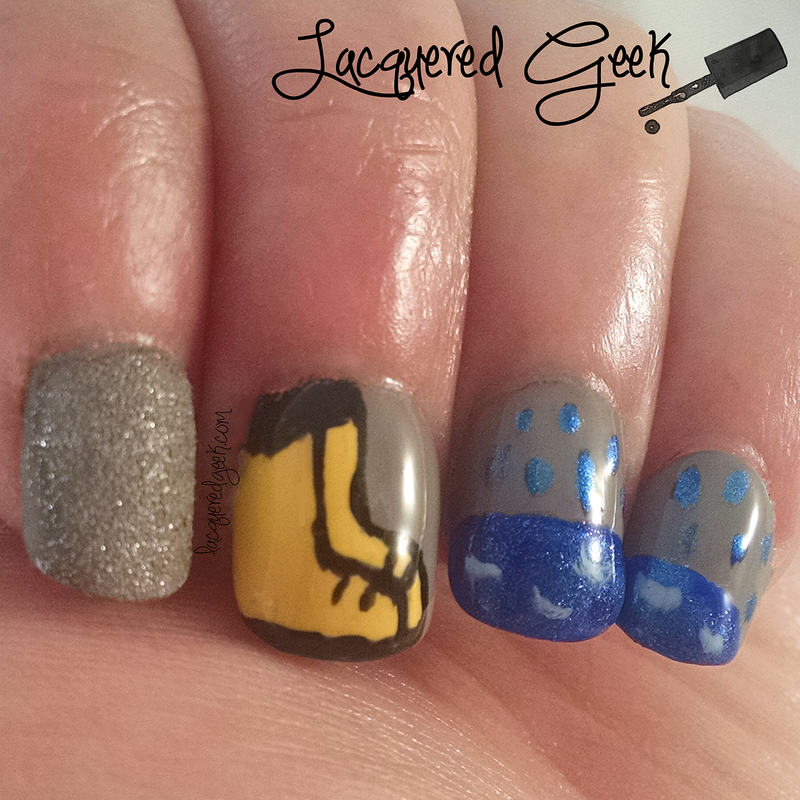 Be sure to check all the talented bloggers below to see more April Showers nail art! Great manicure! I love your take on the theme! I love your galoshes! I would have never thought of that. Wonderful theme for the challenge. Thank you! I think they turned out pretty well! Thank you :)) That was what I was trying to recreate!